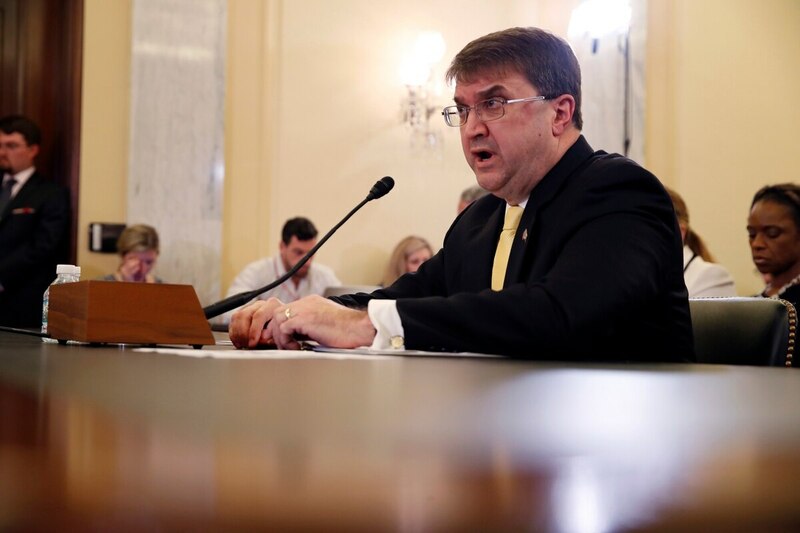 WASHINGTON — Less than two months into his term leading the Department of Veterans Affairs, Secretary Robert Wilkie insists the department is finally on the right track. “We have a full organizational tree of people I’ve been able to bring in, including the chief of staff and a new acting deputy. … I’m very happy the institution has calmed down,” he said at an appearance on Capitol Hill Wednesday. Whether that calmness will continue remains to be seen. Wilkie, President Donald Trump’s replacement for David Shulkin — the VA secretary he fired via social media this spring — was peppered with questions from skeptical senators Wednesday at his first congressional hearing since taking over the veterans bureaucracy. Among the questions: Is the workforce morale improving? Are Trump’s business friends outside government unduly influencing department policy? And can senators expect real changes from Wilkie after hearing similar promises from past VA leaders? Despite — or because of — a budget that has swelled to over $200 billion for fiscal 2019, VA has faced a steady drumbeat of criticism from lawmakers since 2014, when then-VA Secretary Eric Shinseki was forced to resign over allegations of records manipulation by senior staff. Since then, VA leaders have worked to restore congressional and public trust in the institution, with mixed results. Wilkie’s next test on that will come on Thursday, when VA officials brief lawmakers on his work developing new rules for a forthcoming overhaul of department community care programs. Both the new secretary and president have repeatedly said they’re offering more “choice” to veterans in their health care options, and Congress in June finalized a series of sweeping changes designed to ease the path for veterans to get VA to cover the costs of a host of outside medical appointments. But developing the rule — a process expected to take months — will require carefully balancing issues of health care flexibility with concerns over privatizing much of the VA’s core mission. Wilkie on several occasions, including Wednesday, has said he is opposed to privatizing the department. Democrats in both chambers have said they fear the new standards, if written too broadly, could do just that. Several on the Senate Veterans’ Affairs Committee also confronted Wilkie over reports that a trio of businessmen with membership to Trump’s Florida Mar-a-Lago country club have had significant influence over past VA policy, including being involved in the firing of Shulkin. Wilkie said he has only met with the men once, an hour-long meeting when he was acting secretary, and insisted they have no policy role today. “I am committed to making sure I am the sole person accountable to you,” he said, adding that while he is open to outside advice, no VA staff are currently consulting with the men. The son of a wounded Vietnam veteran, Wilkie said he understands the national importance of the department, and vowed to see it succeed.